A beer expert and two beer enthusiasts convened to sip and discuss three brews: Founder’s Kentucky Breakfast Stout, New Holland’s Dragon’s Milk and Blue Mountain’s Dark Hollow. See what they thought of the brews here. All beer is not created equal. 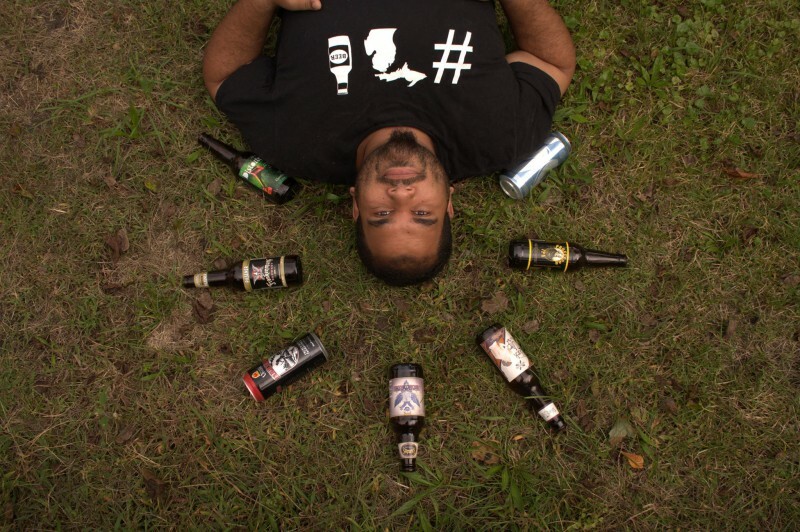 “Can we pull off a stylistically restrained taste testing of multiple beers?” local beer expert Ben Darcie wonders. Darcie joined two Rapidian interns, Hayley Grzych and myself, to help us with our reporting assignment. 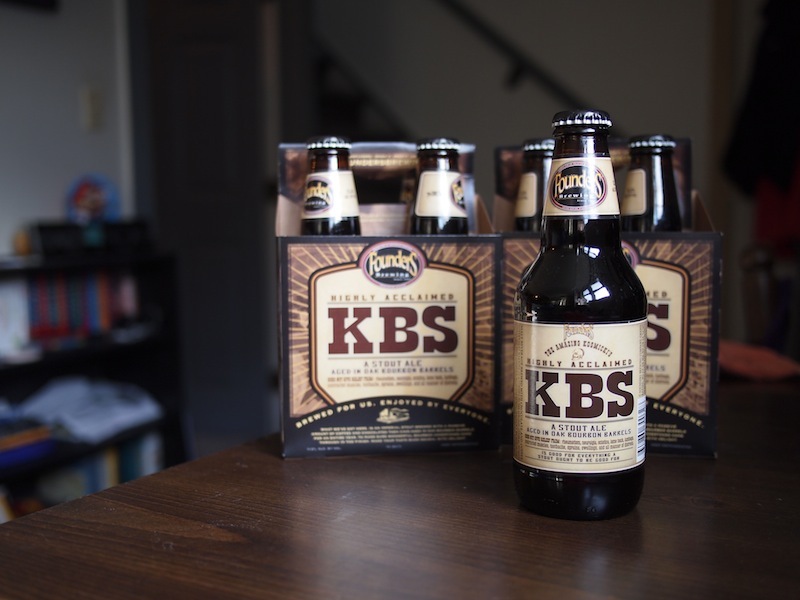 The challenge: to see how local Founder's Kentucky Breakfast Stout (KBS) stood up to the competition. 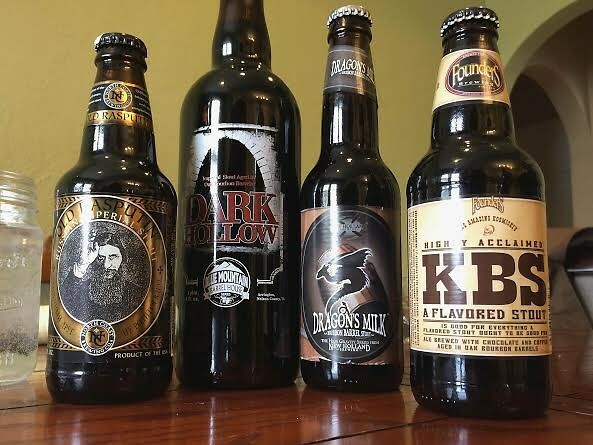 We all love beer and wanted to bring the much-hyped and much-loved KBS against contenders New Holland's Dragon's Milk and Blue Mountain's Dark Hollow. We knew full well that testing bourbon-barrel aged beers against each other wasn't entirely fair. Kentucky Breakfast Stout, in addition to being aged in oak bourbon barrels, is brewed with coffee and chocolate. No other beer is brewed to the same specific standards and with the same ingredients of KBS, just as no other beer is brewed to the specific standards and with the same ingredients of Dragon’s Milk. Comparative dissection of such radically different brews becomes too based in personal preference to help someone trying to decide what beer to drink. 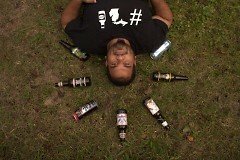 We decided to refrain from ranking the beers. Instead, we took samples of each beer and discussed what we liked about each and what we thought could be improved on. We paid special attention to how flavors interacted, to the mouth feel and to where the taste of beer was among the flavors. The Local: Kentucky Breakfast Stout: This seasonal stout, brewed in downtown Grand Rapids at Founders Brewing Company, is flavored with chocolate and coffee and aged in oak bourbon barrels. When tasted cold, the chocolate overwhelms the coffee and bourbon on the palate. That isn’t such a bad thing. As the beer begins to warm, the coffee notes become more prominent and the bourbon flavor becomes more balanced with the other flavors. All of us agree that the coffee adds spiciness. 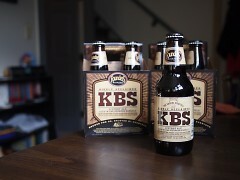 Darcie also notes that for all of KBS’ flavors, the taste of beer is stunted. The warm beer’s thick and syrupy body seems to lend itself perfectly to winter. We all agree that Kentucky Breakfast Stout isn’t our favorite brew of all time. We also agree that KBS’ intermingling flavor dynamics make it one of a kind. The Regional: Dragon’s Milk: This year-round stout, brewed in Holland at New Holland Brewing Company, is flavored with vanilla and aged in oak barrels. This high-gravity brew doesn't blow our palates away like KBS or Dark Hollow, although we still enjoy it. Darcie describes a “prune or raisin” taste, and Darcie and I both greatly enjoy the interaction of the vanilla sweetness with the barrel taste. Grzych notes the presence of the alcohol taste. Of the three, Dragon’s Milk is the most easily accessible. It’s more easily paired with meals than the other tested stouts because it isn’t overwhelming on the palate. It’s also available all year long, so getting your hands on a bottle is relatively easy. Although it isn’t something we would store in our basements until we could share it with friends, we would recommend having a bottle or two in the fridge. The Out-of-Towner: Dark Hollow: This seasonal imperial stout, brewed in Virginia, is aged in oak bourbon barrels. None of us had tried anything from Blue Mountain Brewery before the test. We were impressed. “This isn’t the sweet, rich chocolate taste of KBS. It’s earthier,” says Grzych. Immediately noticeable is a sharpness in the barrel presence that isn’t evident in the KBS. As the beer warms and the palate adjusts to the flavors, the intensity of the barrel presence mellows, although it's still very evident. Where KBS has chocolate and coffee sweetness and Dragon’s Milk has vanilla sweetness, Dark Hollow has no added flavors. However, the bourbon adds a pleasant sweetness that I enjoy more than the sweet flavors of the other two. Darcie likes the barrel presence in Dark Hollow more than in KBS but wishes the alcohol content in Dark Hollow was less than 10%. Dark Hollow is much more dense than Dragon’s Milk. This is a beer for sharing. The boldness of the barrel-aged taste is enjoyable, but if someone hasn’t tried many types of stout that characteristic might be a con. For regular partakers of stouts, we recommend this beer as a bit of heaven. Each of these beers are great in their own ways and should be experienced. But beer, in the end, is based on personal preference. Grzych says that she notices a rising level of pretentiousness within the local beer community. Newer to learning about craft beers, Grzych and I find this attitude intimidating and stifling. The conclusion of our tasting? KBS lives up to the hype-but maybe not for the reasons people think.